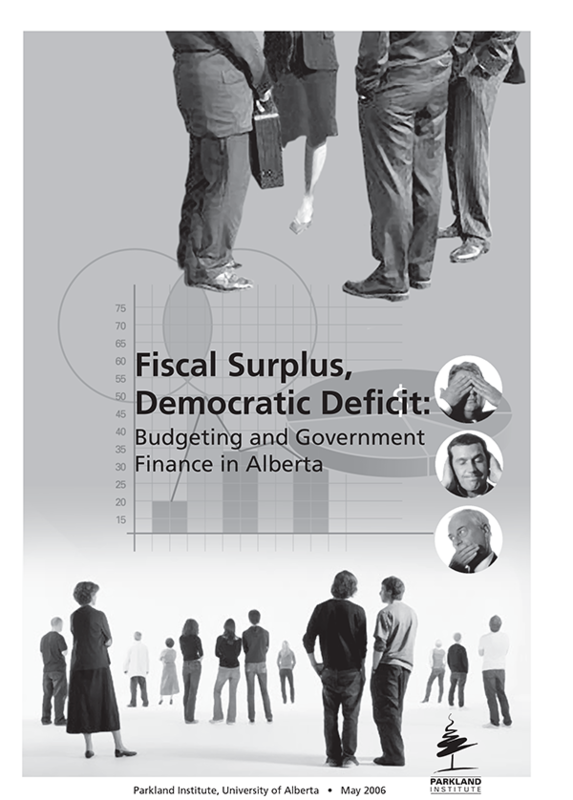 The Alberta government’s formal budgeting process leaves a great deal to be desired in terms of accountability and democracy. The federal process has seriously involved opposition parties in budget deliberation. Alberta’s does not; it excludes opposition parties at the most crucial steps - departmental budget planning and advanced budget input. Indeed the Alberta government’s formal budget process seems designed to exclude serious legislative scrutiny of the budget, thereby subverting the parliamentary principle and mechanisms of citizen consent to taxation. Beyond the formal process, the informal democratic scrutiny of budgets - including public debate, and media attention - is further subverted by the government’s practice of routinely underestimating revenues, particularly revenues from selling off non-renewable natural resources. The result is a repetitive series of ‘surprise’ surplus announcements that in fact are no surprise to anyone. These surprise surplus announcements can buy political popularity, as they are accompanied by surprise spending announcements (including unbudgeted spending, rebates and tax cuts). However, these spending announcements occur when media and public attention are not focussed on government spending, and it is impossible to debate about competing priorities, trade-offs and the budget as a whole. At budget time, the government regularly claims it cannot afford this or that public priority - public health care is the latest target - but later in the year finds money for the latest popularity-enhancing road-building or other capital project. Albertans’ expectations are managed, and democracy thereby limited. The wildly swinging revenues of the Alberta government are the result of its policy decision to cut sustainable taxes, and rely instead on increasing yet unsustainable rents from selling off the public’s fossil fuels. The expenditure side swings wildly because of the government’s ill-conceived balanced budget rule. Balancing revenues and program expenses over the long term is wise, but a rule that spending cannot exceed revenues in any year is both unnecessary and unwise, especially in light of the government’s reliance on volatile fossil fuel rents. In the end, the government essentially did away with the balanced budget rule by creating a number of funds, foundations, and special accounts to absorb money in good years and spend in lean years. This socking away of natural capital rents can help reduce revenue volatility and conserve overall capital levels, but there are accountability concerns with the way the government is doing it. Arm’s length foundations can reduce legislative oversight and Ministerial responsibility. And executive-controlled funds and accounts need structure. All in all, the government seems to be making spending decisions based on the accounting need to distribute bloated revenues, and it seems to have no vision for a prosperous, sustainable Alberta. The government had been blindly pursuing its debt-elimination agenda, and its ruling ideology - cutting public programs - does not lend itself to a guiding vision for a government in fiscal surplus. The government’s own Financial Management Commission pointed out the obvious - that Alberta needs a vision and a strategic plan to guide its spending decisions. The government responded by writing one. However, the process of developing it gave short shrift to the notion of stakeholder engagement. The result was a plan that contained significant contradictions, and whose strategies will make it impossible to achieve key goals, like economic diversification. It is too early to tell where the government’s strategic plan will take the budgeting process, or whether it could help make it more democratic, but the early signs are not positive.